The New York street poet and the Jamaican reggae man take turns playing lead role over a mix of hip-hop and reggae beats melded with trumpets, congas and electric organs, among other instruments. From its title to its lyrics, the album drives home the idea of shared ancestry. Nas and Marley find common ground in their connection to Africa. On each track, they detail the mindsets that divide related people, both on the continent and in the diaspora. 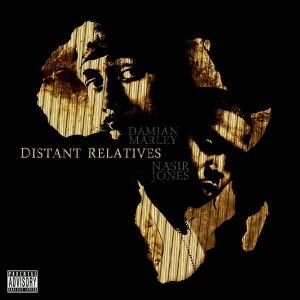 “Distant Relatives” entices listeners to imagine what could be. Nas, always the storyteller, details his kind of icon, a “misfit who handles business,” on “Leaders,” featuring another of Bob Marley’s sons, Stephen Marley. “Africa Must Wake Up,” featuring K’naan, is a call to awareness, and like the rest of the album, the music is as much an inspirational force as the words. \nFrom its title to its lyrics, the album drives home the idea of shared ancestry. \n“Distant Relatives” entices listeners to imagine what could be. Nas, always the storyteller, details his kind of icon, a “misfit who handles business,” on “Leaders,” featuring another of Bob Marley’s sons, Stephen Marley. \n“Africa Must Wake Up,” featuring K’naan, is a call to awareness, and like the rest of the album, the music is as much an inspirational force as the words.